You're just a better person than the rest of us, I suppose. Honestly, at this point, I'd only go to an NFL game if someone gave me tickets in a luxury suite. It's such a bad experience everywhere. (Luxury boxes are amazing. I want to live in one). Cool - that's your preference. But many people would prefer to at least have the choice to stand or sit. Being forced to stand the whole game is one of the reasons many seats in the 100 level sidelines have opened up in the past several years. This new COO can talk all he wants about improving the gameday experience but unless he addresses this issue his talk is sort of empty. What would you recommend? I understand some people dont like to stand during the game, but then again many people prefer to stand. If I was told I had to sit the entire game, I'd just stay home. The only solution I could think of is to designate certain sections as sitting only. But that would be difficult to regulate. Especially as the lower you get in the LL sections, the harder it is to see over the players on the sidelines. Other than that, I'm not sure what the new COO could do to address this issue. Easy - remove the dream seats. The dream seats make it so everyone in the LL must stand. This isn't an issue of when it's appropriate to stand based on game flow, etc. That's a different question. It's an issue of improving the gameday experience by removing an impediment that has caused hundreds if not thousands of people in the LL to give up their season tickets in recent years. Easy - remove the dream seats. The Skins have ripped out probably close to 15,000 seats in the upper deck and were able to relocate folks, so seems like the dream seat thing would be doable. Of course, this is the same organization that made up excuses for years on why we couldn't replace the lite brite with a decent jumbotron. Just got a "final notice" email about my season ticket seats telling me they will be released in a few days. What??? I thought they were released when I didn't renew by the April 1st deadline. Fine, then give current dream seat holders 12- or 24-months notice and move them in 2019 or 2020. As someone else here stated, the organization ripped out thousands of upper level seats and were able to find relocate those people. Anyone get any discounts or special perks for renewing tickets? I couldn't bring myself to renew this year but they're still trying to push them on me. Still leaning towards passing but if they can offer anything to sweeten the deal I might reconsider. GA seats. Fans should only stand during the big plays like 3rd and longs and goal line stands. Please sit for most everything else. Took my elderly father to a game a few years ago when we were in the 100's on the home side. By the end of the first quarter he could not stand anymore so we sat there staring at everyone's backs the rest of the game. After that year we relocated our seats to the 200's which most folks like to sit when it's not a big play. That's why we love our seats in the 200's. People there know when to sit, or stand. We're last row, under cover, backs against a suite. We can stand and sit as much, (or as little), as we want. Washington Redskins fans who wish to vault over the 75,000 names on the waiting list for season tickets to obtain prime seats at FedEx Field for the 2005 season can pay $7,500 to join the team's new Touchdown Club, the Redskins announced yesterday. The Touchdown Club is Redskins owner Daniel Snyder's latest effort to increase the club's revenue. It is modeled after similar programs operated by the Philadelphia Eagles and Miami Dolphins and includes mid-field lower bowl seats as well as a catered pregame party, pregame field passes, parking and a trip to a Redskins game in either Philadelphia or New York. "The purpose of this is to provide a variety of stadium amenities," said Redskins spokesman Karl Swanson. "We looked at the Eagles program, which is a success, and decided it could be adapted well for us." The Touchdown Club follows the lower-priced TailGate Club, which the Redskins started last season. The TailGate Club was criticized by some fans as a money-making enterprise that didn't live up to its billing. Some complained it was not worth the price. The TailGate Club includes a one-time initiation fee of $1,295, plus a $490 season pass for all 10 Redskins home games. In addition to lower-level seats, which are scattered throughout the lower bowl, TailGate Club members have access to a cordoned-off pavilion area just outside the stadium, where food is provided and fans can listen to music and watch wide-screen television. Swanson said the 150 Touchdown Club seats were taken from roughly 400 lower-level seats set aside for corporate hospitality. Under that program, groups of 20 or so fans can rent a corporate tent for around $20,000 per game, including lower-level, mid-field seats, pregame and postgame catered parties and other amenities. Swanson said none of the seats was subtracted from the general admission pool. Season ticket holder Alan Martin, a lawyer for the federal government, sits in the corner of the upper bowl and said he would love the opportunity to move lower. But he said the price of the Touchdown Club and TailGate Club is too high. "We like lower-level seats, but we're not going to pay for that kind of stuff," said Martin, contacted by telephone yesterday. "If I could get lower-level seats for a reasonable premium, I would take them. Dan [Snyder] is constantly thinking up gimmicks to make more money, but that's his business." Snyder has expanded the capacity of FedEx Field to 91,665, the most in the NFL. There are about 66,500 general admission seats. What is capacity at this point? I don't know how the current number of 82K is arrived at. 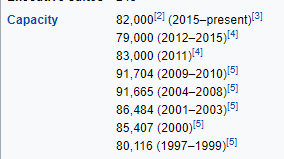 If the max capacity at one point was a hair under 92K, the various Post articles (cited in the Wikipedia page) have the Skins removing from the upper deck 10K seats in 2011, 4K seats in 2012, and between 4-6K seats in 2015. Now yes, some of those torn out seats were offset by the creation of the SRO areas in the upper deck, but I'm not sure if the figures are counting the seats torn out in the club level to make way for the club party decks, which have themselves been tarped over and should not be counted in the capacity numbers. I would say that the capacity at FedEx, counting seats, SRO, and suite capacity, is likely no more than 75K. 79K after the reductions in 2012, but take out the obstructed views and who knows what it will be. The Redskins in 2010 said FedEx had a capacity of more than 91,000, but that was lowered to around 83,000 last season after the team removed seats from the end zone areas of both upper decks. With the latest renovations, the stadium’s capacity will be 79,000, according to Samuel Wynkoop, the director of Prince George’s County Department of Environmental Resources. The total capacity may exceed 79,000 when the tickets sold for the party decks are accounted for, and it’s expected that the Redskins will offer between 4,000 and 5,000 standing-room tickets per game, according to one person with knowledge of the Redskins plans who spoke on condition of anonymity. But Mark, they further reduced capacity in 2015, whacking the top eight rows off the sideline sections of the upper deck. As well as at some point tarping over the club level SROs. Do we know for sure if the 200 level OVs have been removed? Someone had alluded that they were not going to be sold as season tickets, but are they still going to be available for individual games? I personally prefer to stand, particularly when on defense. However, I do take a look at the people behind me and if there is someone who is elderly or disabled and cant stand, I will do my best to sit. But if the people in front me me are standing and I cant see, well I will get back up and shrug it off as "I tried". And I agree, if you are someone that prefers to sit, the 100's are not for you. It's unfortunate for those that like to sit, but I dont see that changing anytime soon. Lots of good sideline seats still available. I just upgraded myself from the 15 to the 40 yard line in section 220. My friend just upgraded from upper deck to the 35 yard line in 223 I believe. Most available seats are on the visitor's side. Lots of good end zone seats also. As far as I could tell, no obstructed view seats behind the pillars are available. So perhaps it is true they are not selling those tickets. Sad to see how easy it is now to get redskins season tickets. No longer a ticket in demand. Login to your account and try to buy tickets. It will take you to the ticketmaster app and you can check various sections you are interested in. Then call the ticket office with the seats you want to upgrade too. Took me two minutes.